The following links provide background to the study species, including their identification, their migrations, the UK population trends for species that breed here, and the distribution and phenology of breeding and wintering thrushes in Britain and Ireland. Read a brief introduction to the main study species for the Winter Thrushes Survey. 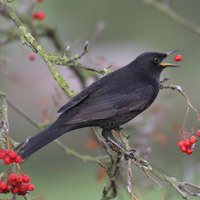 For more identification tips, watch our BTO Bird ID videos on Night singers (including Blackbird and Song Thrush), Ring Ouzel / Blackbird, Song Thrush / Mistle Thrush and our latest on Redwing / Fieldfare. Our study species have widely differing world distributions and patterns of seasonal migration. Read a summary of migration and movements for the six common thrushes, Waxwing and Starling. All the thrushes consume berries but we need to more about which sorts of berries are important food sources, and how this may vary between the thrush species and between UK regions. We suspect there will be behavioural changes through the winter as berries gradually become depleted. The wider countryside provides berries mainly from native trees and bushes in woodlands and hedgerows. Berry identification is therefore important to the Winter Thrushes Survey. Observers will need to carry printouts of these forms, and one of their route map, on each recording visit. Please see our video tutorials if you require help in using the survey's online pages.